Some people believe that giant lizards secretly run the world. Others (admittedly fictional) believe that the universe was sneezed out of the nose of the Great Green Arkleseizure. In this clever, compelling tale, Calamity Leek and her sisters believe that they are the Mother Goddess’ army in the impending war against Demonmales, who would otherwise drag them all down into the bowels of hell and eventually smash through the sky lid and take over heaven. Calamity, like many of the sisters with whom she lives in the Garden at St Emily’s Orphanage, is in her teens. They spend their days tending roses, sewing cushions and looking after their younger sisters. All they know about the Outside is imparted to them by Aunty, who – with infrequent visits from Mother – are the only adults that the sisters ever encounter. Aunty prepares them for the Fight by allowing them to watch the occasional lesson from the Showreel, in which she demonstrates many of the demonic tools deployed by Demonmales such as Love and Marriage via clips from musical theatre. She also writes the Ophelia Swindon Archives, entrusting Calamity with the Appendix, which includes entries on important topics like Injuns. But before they have chance to embark on the Fight, things start to go awry in the Garden with devastating consequences for all concerned. If M. Night Shyamalan wrote books, he might well write one a bit like this. It’s a clever, dark, compelling, mysterious, macabre tale that quickly develops into a page-turner; it's one that you still think about for days after you finish reading it. All of the characters – and their idiosyncrasies – are expertly crafted, as is the world that they inhabit; you can almost see and smell and touch them. But the real joy of the book is the clever, measured way in which Lichtarowicz very gradually brings the truth of Calamity’s world into focus, through her eyes. She sows the seeds of doubt about the truth of this world in the reader's mind by flitting back and forth between Calamity in the present and Calamity in the recent past, allowing the reader to gradually begin to piece the real story together. At times these intermittently staccato bursts of story are a little frustrating, particularly when one storyline is becoming especially intriguing. It's only when you reach the end and think again about all you know about the Garden and its inhabitants that you appreciate that right from the title, Lichtarowicz was telling us a completely different story than the one you initially thought you were reading. When she isn’t crafting fine works of fiction, Lichtarowicz works in TV variously as a producer and director, involved in documentary making (and Come Dine With Me); this is her first book, and what a debut. 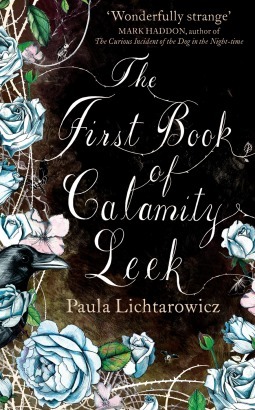 Here's hoping that The First Book of Calamity Leek is not the last book of Paula Lichtarowicz.